My close friends and competitors…sometimes one in the same…know that I love embellishing my art quilts. Some quilts simply call for embellishments and, when this is true, I use them generously. This subject recently came up in a Facebook conversation and so I thought I would run a series of three or so blog posts, not necessarily one right after the other, on my embellishment techniques. You may have others or your techniques may vary, but these are mine. I’m always looking for new ideas though, so comment freely please. My love for embelishments started decades ago when I had my own fashion design and tailoring business when I designed and my shop made formals, wedding dresses, and costumes for operas, dancers, and skaters. Back at the beginning of that business, I hand sewed or glued most of my embellishments on. Today I will hand sew some things still, but I use a lot of hot fix crystals and machine techniques that I will talk about in future posts. When I first started using hot fix crystals years ago I bought one of those wand style irons. I still use it by the way, but I’m thinking of replacing it and maybe I can get one that doesn’t flip off the table and land on the carpet and I have to race to pick it up before it burns it…hoping not to burn myself in the process. It’s supposed to pick up the crystal and you can then place it down, but it never really worked well that way. Sometimes it would pick it up and hold on to it, so I had to get a straight pin and pry it out. So I started placing the crystal down where I wanted it and placing the wand iron on top of it. If I was lucky, the crystal would end up in the right place (though I found I could move it slightly if I worked quickly enough). Sometimes the wand would flip the crystal out of place like a tiddly wink and it would go spinning through the air landing who knows where. Sometimes I ended up slightly burning the area around the crystal. And sometimes I ended up burning myself trying to prevent all these things. Put on your music or audiobook. Cut a piece of the transfer tape (I use both a smaller cut of around a six inch square and a larger cut of about a 10 inch square. It’s reusable about four or more times. Remove the backing from the transfer tape. 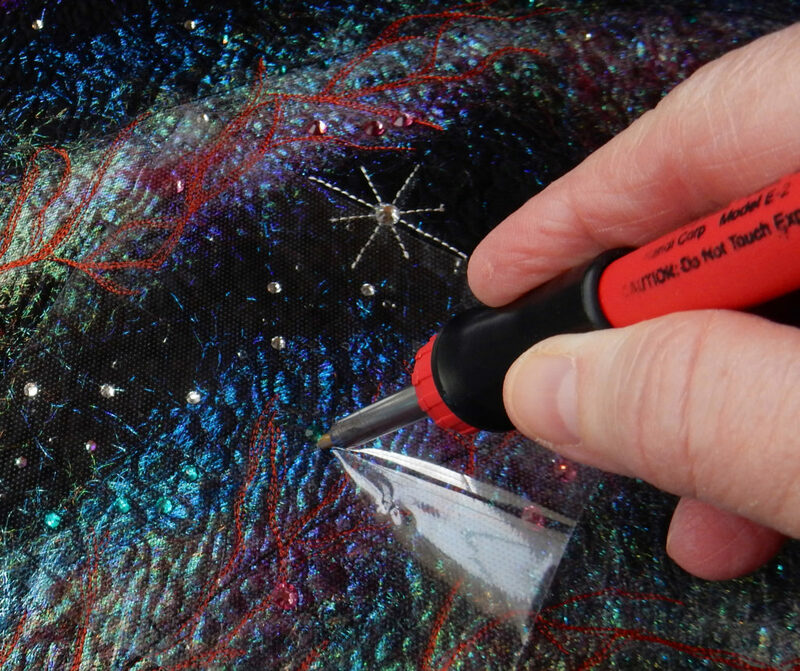 Gently and carefully lower your transfer tape piece down over the section of crystals trying not to disturb the pattern and press it down around the crystals and more or less attaching to your project. Now here you have a choice. You can either use your regular iron set hot and without steam or the wand iron. I found the wand iron makes the crystals more secure for the most part but takes longer. tiny ones require about 12 toe taps or slow counts. larger ones require more…30 seconds to 40 counts to be really secure. The transfer tape acts as a pressing cloth, protecting the fabric to which you are attaching the crystal from burns by the wand. It also holds the crystals in place so they don’t go flipping off into never never land. If it gets just a little out of alignment, you just move the tape…the crystal stays on the tape until it is fully glued down and then releases with no problem. This means you can pick up your tape slowly to check if you’ve missed one or if it needs more time. Another way to approach it is to place lots of crystals on the tape upside down to the sticky side and just move the tape around and place the crystals on one by one. This is a particularly good method for clothing and other shaped pieces when you are having a hard time getting them flat for crystal placement. Now if I can only stop my hot wand from falling off the table that would be good. Maybe I can find a new one at Mid-Atlantic Quilt Festival that I am going to this year with my good friend Mei Ling…I’m so excited. I’ll let you know if my quilt gets in. Will I see you there? Sew happy everyone! Help each other out, encourage other quilt artists…both the beginners and the very advanced. Even the big winners sometimes need encouragement. By the way, I have many of my quilts for sale on my website. You can see them here. I really want to go to Houston and keep on writing this blog and that is where the money would go. If you are interested in one of my quilts, contact me at BettyJo@bjfabricartist.com Or, if you just want to help support the continuance of the blog, see the donate button. But please keep reading my blog even if you don’t…I understand. 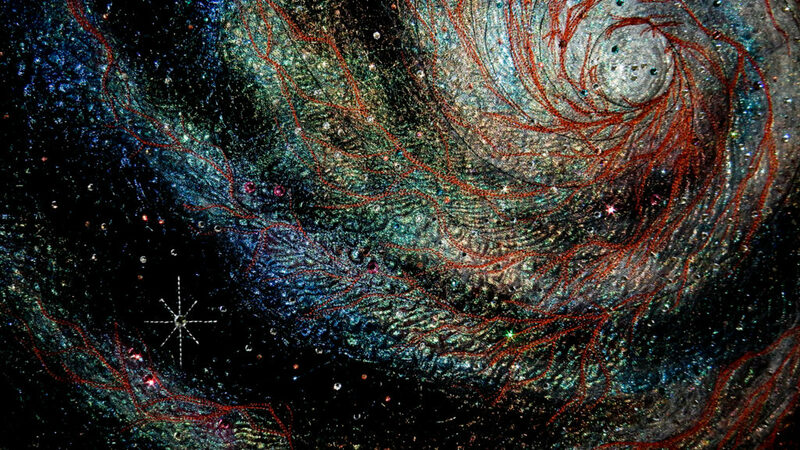 Tags: Deep space quilts are fun to make, Don't give up without trying something else first, Encourage new sewists and quilters, Encourage old sewists and quilters, I love comments. When I finish a show quilt I really enjoy making I experience mixed feelings of delight that I have made a new quilt and a little let down on not having it to work on any longer. This is at least in part because I am driven to create. I love showing my quilts to share the fun with my friends and in the hope that it makes people happy or inspired. It adds a little spice and fun to that when I win a ribbon too. I love sharing my techniques and quilt adventures because I would be delighted to see what I have learned become useful for other quilters. First of all, you can see pictures of many of my quilts either on my website gallery or you can also see them here on The Quilt Show. If you click on the photos in my website gallery, you’ll get the full view and look at the caption on the bottom of each quilt for the name of the quilt and the price of the quilt if they are for sale. If you are interested in purchasing one of my quilts, or just want to know more about it, just contact me at BettyJo@bjfabricartist.com and I’ll get back to you shortly with more details about them. I have a paypal account that enables purchases safely, so just contact me at BettyJo@bjfabricartist.com and I’ll get back to you shortly. If you are going to AQS Syracuse at the end of this week and over the weekend, my little quilt Canterbury Knight is in the show. It’s been through several shows and received Stevii Graves Judge’s Choice ribbon at Mid-Atlantic Quilt Festival earlier this year. I would be very surprised if it takes a ribbon, but it is a very nice little quilt you would probably enjoy seeing. I’m thinking this is probably the end of its show season and I plan on hanging it in my living room when it comes home. It’s sister quilt Canterbury Silk is already hanging, and I think it will be a nice addition. So I’m keeping these two quilts and not putting them up for sale. G Street Fabrics in Rockville has generously hung several of my quilts in their Bernina section. Those are for sale, and include Dad’s House Plan, Kanazawa Memories, and The Storyteller. I periodically change the quilts hanging there. If you live or are coming near Ashburn, Virginia, send me an email and we can arrange for you to come see any quilts that happen to be here at the time. Next it’s full speed ahead on the quilt my son Ken designed for me and continued work on my book. Sew happy everyone! Teach someone to quilt…your child, grandchild, husband, wife, or neighbor. It can be fun for everyone and a great stress reliever in these troubled times. Since my last blog I have made much greater progress than I anticipated by this time. 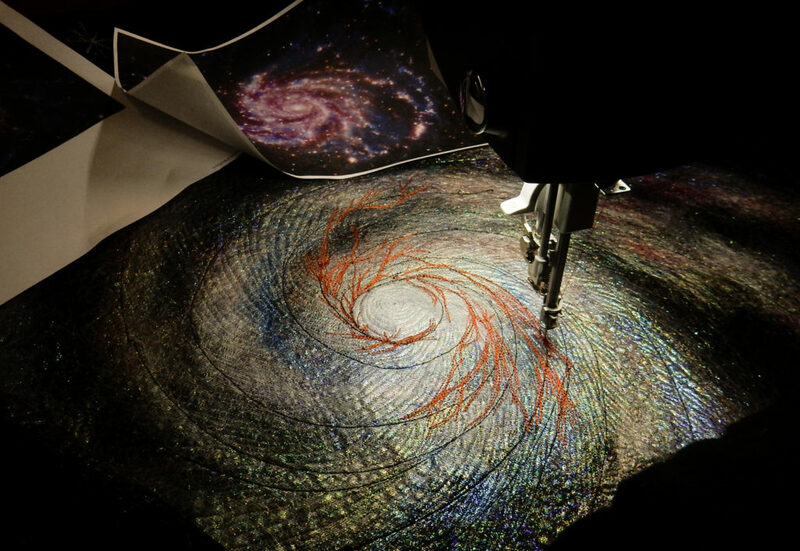 I have completed the basic quilting, and I am currently adding the rust colored star dust streaks that swirl through spiral galaxies. I was a little worried about this part of the quilt, because the dust swirls in complex ways throughout the overall spiral and there is no way to mark this quilt. I am happy to say that my method seems to be working, so I thought I would share. 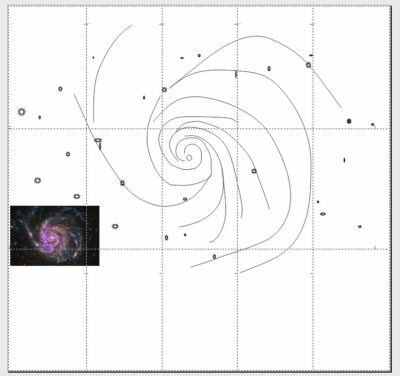 I started the quilt by placing a NASA photo of the galaxy I am using as my model (see my last blog post) in Corel Painter and “tracing” a simple outline of the placement of the spiral arms and then moving it to Corel Draw and printing it full size. Corel Draw will tile a picture into whatever size paper your printer handles, so you can tape it together and have a full sized pattern to work with. If you have Bernina V7 design software, and don’t have Corel Draw, you can use the art canvas, which is a version of Corel Draw. I also have found that Excel spreadsheet will also tile a picture, which is what I used before I had Corel Draw. This shows how Corel Draw has divided the full sized picture into tiles for printing. Then I traced the pattern onto the black fabric, but that is the sum total of any kind of pattern I could use on this quilt because after the Angelina Fibers and the veiling are placed down, you can’t trace anything, and there really isn’t much more you could make a pattern for anyway. Sew I have gotten all the fiber applique and nylon veiling completely quilted, using 40 weight black thread and rulers for the basic swirl, monopoly over the fiber applique part and black 100 weight silk over the purely black part. I also embroidered spire star backgrounds for ten stars, using in-the-hoop and gray variagated 40 wt thread. This is the third of my deep space quilts. Now that I have developed the techniques for making pictorial deep space quilts I am planning on making more. I’m not sure how many more or which wonderful space entities I will use for the models. I hope to develop at least enough to put together an exhibit in some gallery somewhere some year. I have discovered that some space entities work better than others for my quilts. I have found that those that have more distinct characteristics, those that have more color, and those that stand a better chance of the viewers recognizing what they are looking at seem to be the best models. Maybe some of the quilts will actually earn some ribbons for me. That would be wonderful. Sew happy everyone! I hope you can have some time to create in your studio this week. Tags: Buy David's new book and you will have a fun read, Deep space quilts are fun to make, I love comments., What is that crazy B.J. doing now?